Most currently used single optrodes are bifurcated structures at their tip and may cause extensive tissue damage upon insertion into the brain. Our novel solution integrates a light emitting optical and a recording carbon fiber into borosilicate glass sheathing in a coaxial arrangement to minimize tissue damage. 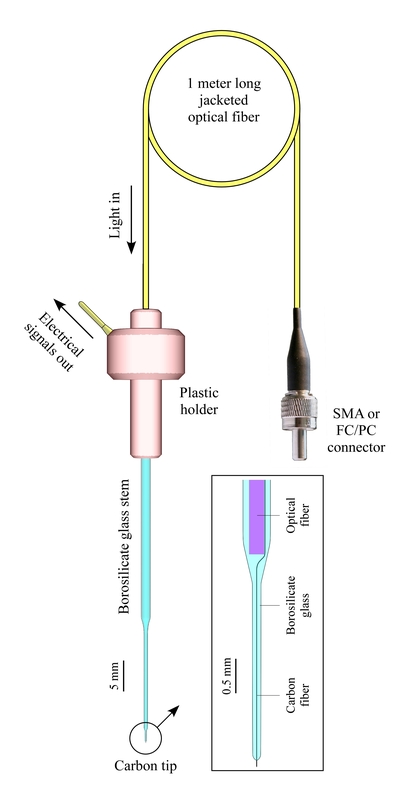 The light projected by the optical fiber is conveyed down by the thin borosilicate glass extension and it is delivered through its convex ending toward the target neurons. The carbon fiber tip protruding from the glass ending picks up electrical signals from the affected neurons with excellent signal to noise ratio. Electrical signals may include spikes from single or multi units, field potentials as well as signals from electrochemical measurements or from micro-biosensor applications. Here, we offer a user friendly, fully assembled single micro optrode for leading edge research applications at a reasonable price. This microelectrode system allows true ‘plug and play’ simplicity right out of the box. The minimized tissue damage may lead to obtaining neurophysiological data that have not been possible to see before. The durable tip allows many re-uses after proper cleaning and storage in between experiments. Custom modifications are possible. Please contact us for details.